We’ve released a new extension for WooCommerce that many of you have been asking about. The WooCommerce Order Status Manager will allow you to create custom WooCommerce order statuses and completely integrate them into your orders flow. Rather than simply adding a one-off status with custom code, you can integrate these statuses with core statuses for a seamless order management experience. Add a custom status, icon, and action button easily. Then, create a “Next Statuses” path to design a workflow. This will allow you to add existing action buttons to a custom status if it’s used by an order, but you can also add custom statuses as “Next Statuses” for core order statuses. This means that a “processing” order can not only have a “completed” action, but you can also add your own actions, such as marking it “awaiting shipment”. 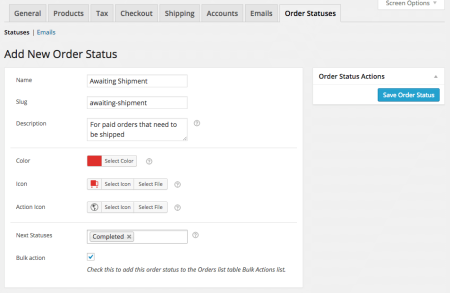 You can also add new WooCommerce order emails, which can be triggered by core or custom status changes. These emails will be added to your WooCommerce emails list and will have their own templates created. 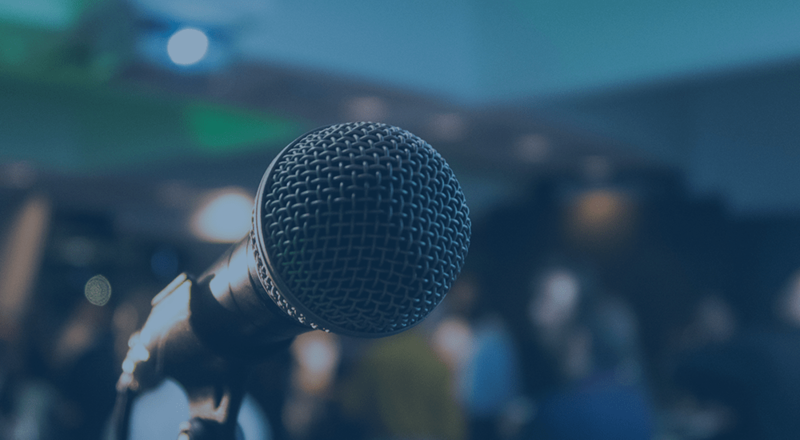 You’ll be able to adjust content from your settings, or complete override the template for fine-grained control over email content. Ready to integrate custom statuses into your workflow and automate new order emails? 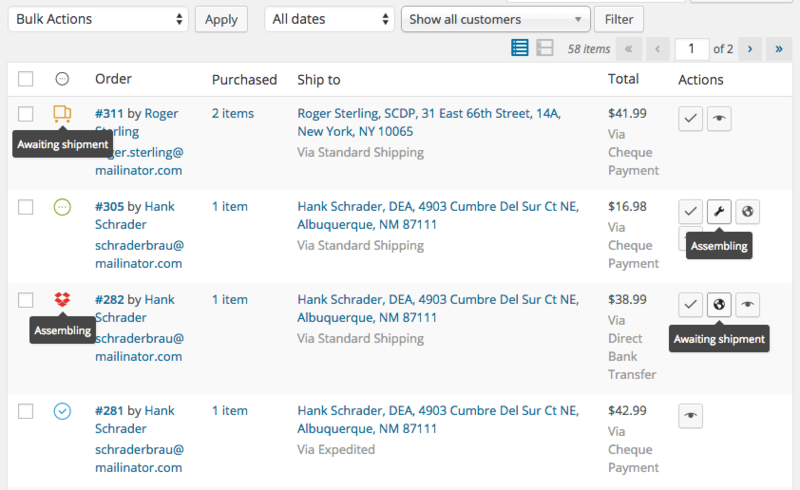 You can now grab the WooCommerce Order Status Manager for $49 🙂 . Hi, this looks good on a blog post, but… I purchased your order-status-control plugin, and it simply doesn’t do the 1 job it’s supposed to do. I submitted ticket #256201 to Woo a week ago, and then directly to you, with no reply. When should I expect to hear from your support team? Hi there! We updated the ticket with an initial answer 4 days ago and it’s marked as awaiting your reply — could you log in and have a look please? This FAQ may also be helpful. Cheers! I’ll login now and follow up there. You guys make me so happy. I was holding out buying a version from CodeCanyon pending this release. When I saw it I jumped all over it. I didn’t reeeeeally want to file a ticket so I’m just going to let you know a few things that I noticed. 1) if the slug of the custom status is to long (i.e. invoice-outstanding-balance) then it won’t apply the status to the order they need to be shortened in order to work; super weird. 2) On the custom status creation screen the color picker doesn’t allow for us to enter a hex number value. We have to enter HSL or RGB. Let us enter hex values please. 3) When creating a custom order status without an icon, the font size that gets generated for the statuses is very small and hard to read. Additionally the spacing between the font and the edges of the custom order status mark container is really tight. To get around this I simply created an admin stylesheet and modified the font/padding for the custom order statuses while slightly increasing the size of the order status column to accommodate as well. It would be nice in future updates to see this given more breathing room by default. Feature Request: It’d be super neat if in a future update we could choose if we want the custom order status colour to be a filled bg or an outline (border) for custom statuses that don’t have an icon set. Hey Amber, thanks so much for the feedback! So happy to hear it’s working out for you 🙂 . Have shot you an email with a response, #1 & #2 fixes are already in progress. Cheers! Hi. I have the a custom order status we use after “completed” called “shipped”. The issue i have is the downloadable products get “invalid download’ because of this new order status. Is there any way to change the permissions to grant access to downloads with the “shipped” order status? You’d need to filter the statuses that grant download access as well, and probably also filter that this is a paid status. I don’t recall the filter names off the top of my head, but our Order Status Manager plugin will do this for you (and it also includes reporting) if you mark a status as a “paid” status. Thanks for your reply. I’m a big fan of your plugins. 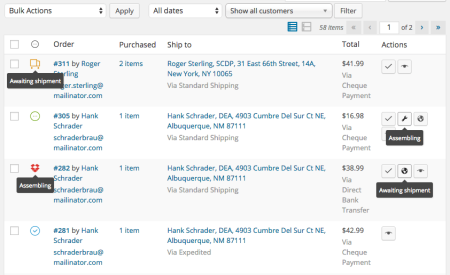 We have also the WooCommerce Order Status Control so we set to completed all the orders after payment. This status was renamed to Paid – Awaiting Shipping. Then once the order is shipped we manually change the status to Shipped. That is when the download permissions are not working. Did you received the ticket number? Yep, confirmed bug and patch in progress 🙂 Fulvio is getting the ticket updated for you with further details. What if an item is not paid for but the custom order status is changed to “shipped waiting on payment”. Can the customer log into their account and pay the invoice even though the status has been changed from “payment pending”. Because currently nothing can be paid if payment pending status is not the current status. Hi Charlie, WooCommerce only recognizes certain order statuses as “needs payment” to display that payment information, so a custom status isn’t immediately recognized with this. We’re adding this into our Order Status Manager plugin soon, or you could use some custom code to add your own status to the “needs payment” ones — here’s an example, and if you need help modifying this or taking it further, we recommend Codeable for these type of jobs.